I have a soft spot for Bermondsey and we’re back there again. 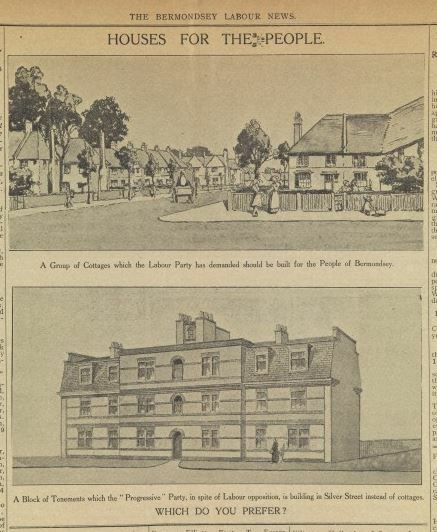 This is a short article about a tiny estate but Bermondsey Labour Party had come to the conclusion that small was beautiful well before EF Schumacher. 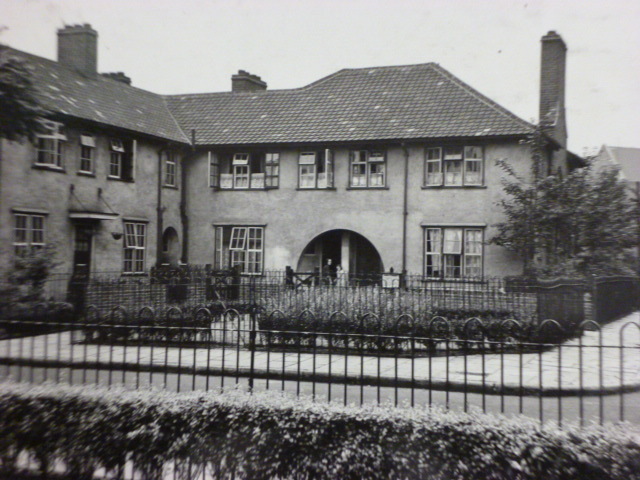 The Council naturally sought health and well-being for its population but it aspired to beauty too – as this earlier post explains. Living in one of the most densely-settled, slum-ridden and industrialised boroughs of London, Bermondsey’s Labour activists sought to raise the conditions of the people by all means possible. 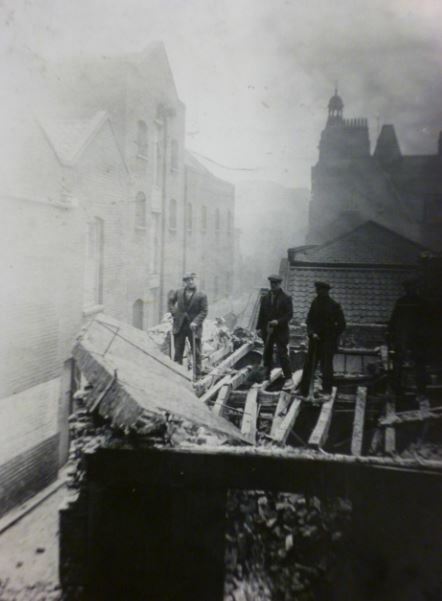 Slum clearance and rebuilding were, of course, a major priority and it was the nexus of the two that best reveals Bermondsey Labour’s unique brand of political idealism. In large part, this special quality to local Labour politics reflected the personality of its principal figures, Dr Alfred Salter and his wife Ada. They had joined the Independent Labour Party (ILP) in 1908, convinced that nothing other than outright socialism could fulfil their Christian idealism and transform the conditions of the people among whom they lived and worked. We’ll pull down three-quarters of Bermondsey and build a garden city in its place. 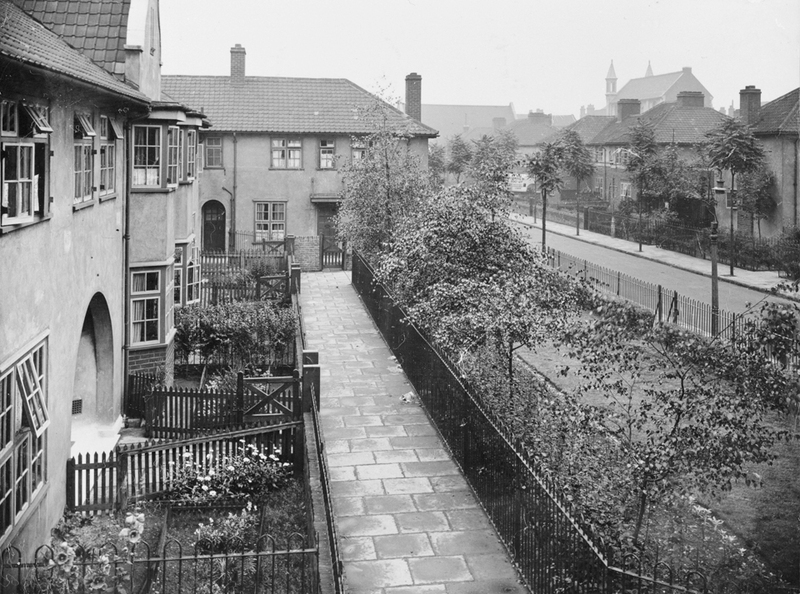 When Labour did win power – it secured a majority on the council in 1922 – that essential vision remained in place and its first test was to be the clearance of a notorious area of condemned housing in Salisbury Street. These four acres housed some 1300 people. Death rates from respiratory disease were three times the London average, the infant death rate twice the London average. That the housing should be cleared was not in doubt – it had been condemned thirty years earlier. The issue was what would replace it. The Labour Party stands for a cottage home for every family, and though this may not be possible at the present moment, we shall work and fight for measures tending to that end. No more Progressive barracks and Coalition skyscrapers! The high-rise developments they decried were the tenement blocks that were being built to rehouse many working-class families in inner-city London. The plan to transform Bermondsey into a garden city was not to be compromised. 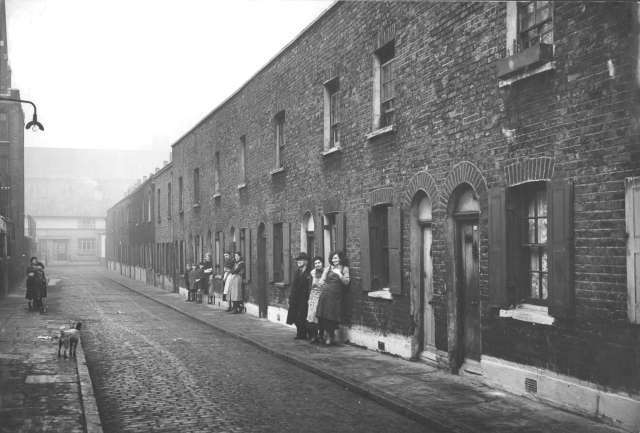 Instead of tenements, Labour proposed a small estate of 54 cottages – ‘trim structures of warm, red brick, some with bay windows, others with recessed doorways, sheltered by an arched doorway’. Each would have three bedrooms, a living room, scullery, larder, bathroom and lavatory with hot and cold water. The new estate would house around 400 people. 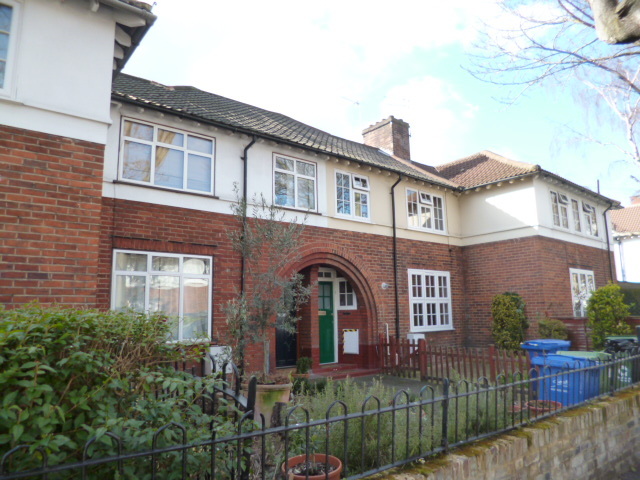 The estate’s designer was Ewart G Culpin – a leader of the Garden City movement and later a prominent Labour member of the London County Council (LCC). He would go on to design the modernist Poplar New Town Hall which I’ve written about previously. break up London as we know it, to encourage the exodus outwards…and to plan a wide outer ring on garden city principles…We would build no more tenements…we would build new towns where possible, or garden suburbs where that was the best we could do. create not only hardship to…such persons who would have to be accommodated elsewhere, but an unnecessarily large burden on the community for the sake of the favoured few who would be housed in the cottages. In fact, neighbouring borough councils were also anxious, fearing that any displaced residents of Bermondsey would simply add to their own problems of overcrowding. The Ministry of Health – responsible for housebuilding subsidies – blocked the proposals and requested the council submit a tenement scheme which would rehouse more people in the borough. Bermondsey, though, had ‘decided that it would not put up anything of which it would be ashamed’ – ‘it steadfastly refused to warehouse the people in barracks’. And it won. The short-lived Labour government of 1924 and Minister of Health, John Wheatley, sanctioned the scheme. Work began the following year and the estate was officially opened in November 1928, built by direct labour at a cost of £550 per dwelling. He boasted £2000 collected in rents and not a penny in arrears: ‘We find that the people have responded magnificently to the Council’s efforts on their behalf, and they are taking infinitely more pride in their homes than ever before’. There you have the early Labour Party’s paradoxical mix of paternalism and self-improvement in a nutshell. Ironically, it’s middle-class academics and some self-styled revolutionaries who feel most affronted by it. I’d simply point out that this was a conversation occurring within the working class. If you visit the area today, you’ll find the estate between the new (1999) Bermondsey tube station and the river. And you’ll notice that Bermondsey is not a garden city. 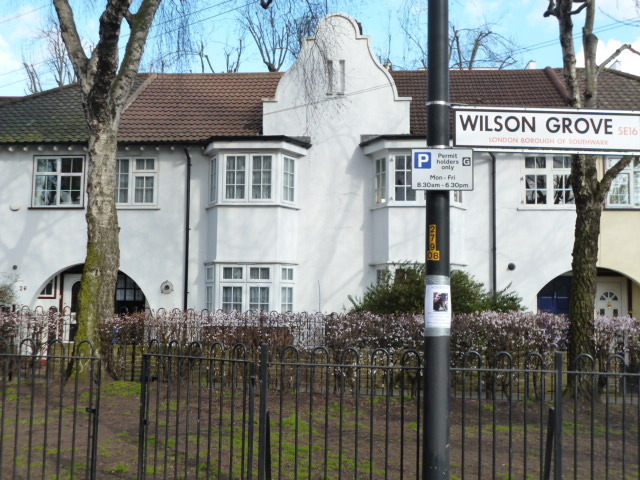 The Wilson Grove estate – a new identity to mark the distinction with its past – was the high-water mark of local Labour garden city ideals. Plans for a second, similar, estate in Vauban Street were blocked and the Ministry once more demanded tenements. Salter stated grandiloquently that Bermondsey would ‘refuse to commit this crime against humanity’. But over time a more pragmatic approach developed. 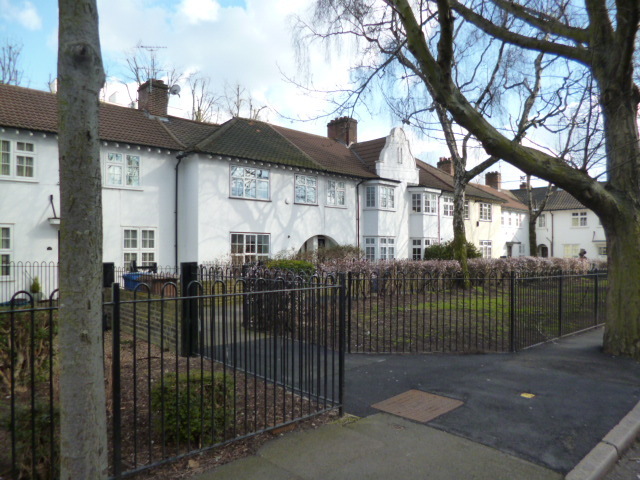 The garden city ideal remained potent and garden suburbs in the interwar period (such as Becontree and Wythenshawe) and New Towns in the postwar period testify to its lingering power. But the need to rehouse inner-city populations more quickly and on a larger scale and the desire of Labour politicians to provide such larger solutions did – you don’t need to be told – lead to the embrace of multi-storey housing. Unavoidable pragmatism and well-meaning ambition did, in the end, trump the principled resolution of Labour councillors such as those in Bermondsey to provide ‘cottage homes’ for all. Having experienced some of the worst mistakes of postwar high-rise, I think we can grant him some perspicacity and the council some credit. Most other contemporary quotations come from contemporary election addresses and newspaper reports provided by the excellent Southwark Local History Library, also the original source of the older images used. If this was an investment it has certainly paid off – these houses now go for very large sums, thus proving their popularity. It’s still a beautiful estate and well worthy of its builders and designers. I just wondered if, during your research, you ever came across the name Francis James Kipps? Kipps was my great grandfather and according to his obituary in the South London Press in 1940 was known as “the father of new Bermondsey”. He was a Labour Councillor for the ‘Saints’ Ward from about 1920 to about 1930. Fascinating article by the way. I too love Bermondsey, although I have never personally lived there. My family have lived there since the early 1800’s. I think I may have quoted him in the piece on beautification but I’d need to check. The Bermondsey story is a great one and it’s good to hear about your ancestor. More coming on Bermondsey so I’ll look out for him. Apologies for the belated follow-up but I can confirm that Cllr Kipps was the source of the quote in my post on beautification: ‘What was good for the West End was equally good for the East’. Just a quick question, the quote from Cllr Kipps, could you tell me if this is in a document and if so where (or if) the document can be obtained? Thanks. It was from the Southwark Recorder, 31/8/1928 – from a report on a Labour election campaign open air meeting. I found it in the wonderful collection of newspaper cuttings in the Southwark Local History Library…but I’m sure you know about that already. Anyway, hope this helps. I live in one of the houses pictured above. Great article thank you, really interesting to read more about the history of this area. I was planning to spend tomorrow repainting the exterior so I’m feeling motivated to do a extra good job now! Thanks, Rachel – glad you enjoyed the article and I hope it helps with the painting! My great Gran lived in the very last house in Wilson Grove on the right – end on to the road, from when it was built until she died in 1977. Her son Alf Martin and his wife Joan lived next door. I remember going to visit when I was little in the ’60’s before the houses were built behind. We used to go right up to the river and look at Tower bridge. I remember that you could see Tower bridge from nanny Martin’s toilet window which I thought was wonderful. This is a truly lovely part of London and that it has survived as it has always been is true tribute to Albert & Ada Salter and their ideals. I hope the people who live there now are very happy. Of course I meant Alfred & Ada Salter. I was born at 4 Janeway st, Wilson Grove Estate on 26th March 1948. his was my Grandparents house. My auntie had it, then she and her husband bought it. They sold it and moved to Kent.Both have died since. I have happy memories there. Our family lived in 25 Wilson Grove since just after being built, we are still there.